Say hello to sweet Tank! Tank is a six year old Boston Terrier that lost complete function in his back end one weekend. 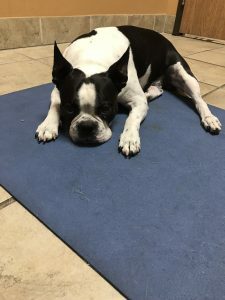 After a trip to the emergency veterinarian, Tank was diagnosed with intervertebral disc disease that had caused a likely disc to herniate or rupture. The family was recommended to do an MRI and immediately follow with surgery, though there was no guarantee Tank would walk again after doing all of the above. After a little internet research, Tank’s parents opted to go the alternative route for a couple of weeks before making any other decisions. Within his first adjustment, Tank went from unable to hold a stand to actually attempting to stand on his own. Though this is not the norm, we were amazed at how quickly his body rebounded. Three days after the adjustment Tank was able to pull his knees up underneath him. By the second visit he was actually pulling himself up to a stand on his toes. At his third adjustment Tank was using one of his back legs to walk while hobbling on the other. And after four visits, Tank is walking and even running, though a little funnily at first. Tank had severe compression of his spinal cord from the intervertebral disc disease, when this happens the body has a natural reaction to shut down, which is where the paralysis comes from. As the vertebrae are able to move again, inflammation dies down as it is flushed out of the system and normal function is able to return. The beauty in chiropractic is that we are able to help return within normal function to the spine, and when that happens, we are restoring balance to the system, rather than just removing pressure from one zone and placing it on another. Because of this, we very rarely have seen pets relapse, which can happen with disc disease. Tank is an absolute rockstar, and we hope you’ll take a minute to see for yourself below!